It was finally time to leave Istanbul for a final time. We took the hotel shuttle over, grabbed breakfast and waited for the Aeroflot checkin desks to open to get checked in for the flight. We then went to the business class lounge for about an hour before going to the gate. The queue/mob at the gate was really crazy. I couldn’t believe how much pushing there was both here and when we were getting on the plane. I was seriously irritated and those of you who have traveled with me, know that this takes a lot. After having another good meal in Aeroflot first class to Moscow, Earl ordered the “American Farmer Beef”. We landed and then tried 3 airport lounges until we finally got the right one. This one was designed to look like a formal lounge and like Phileas Fogg would’ve played whist there. If you followed the posts, the other Moscow lounge looked like it was a disco lounge from the 1980s, while this one had leather tufted chairs from the 1880s and marble topped coffee tables. We went down to the boarding area about 45 mins before and again had to go through crushing lines to get ahead since we were in business class. Once we got settled, we were in the Premier class which has the world’s most confusing seat adjustment instructions. Overall Aeroflot was very nice, they were very aware that we had no clue what they were saying in Russian, I think my blank stare when one of the flight attendants asked if I wanted more bread confirmed that. So, they picked their best English speaker to be our main flight attendant. After I lost count of the number of courses for this meal, I adjusted the seat to the full reclining mode and got to sleep. It was about a 9 hour flight, and I didn’t wake up until we were about 90 mins from landing in Bangkok. 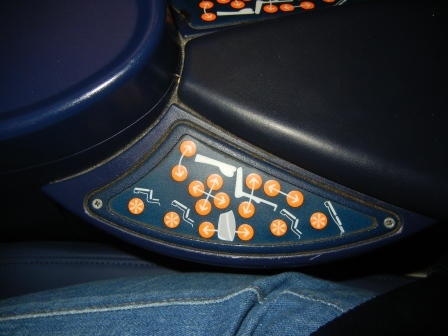 The seat adjustment pictures are hysterical! Thanks for sharing and I’m glad you were able to figure out how to recline the seat. I don’t know if I would have been able to.